Is your Google adwords campaign is generating lots of impression and clicks but having poor conversion rate? You really need to understand important lesson in PPC that will be covered in this article. If you think that you learned to create Google adwords campaign will start generating conversion then you are wrong. You also need to learn the different Adwords features and its impact. 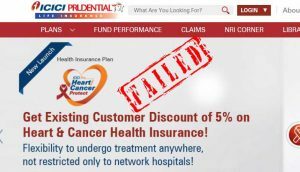 Recently I have published an article on how airtel is losing their potential customer by not optimizing their landing page. And today, I just came across this wonderful example of how they are wasting money on Google Adwords by not optimizing their campaign properly. Airtel cannot enroll new 3G subscribers in 7 zones including Gujarat, if you need more information about this SC order, checkout this article published in April 2013 by TOI. 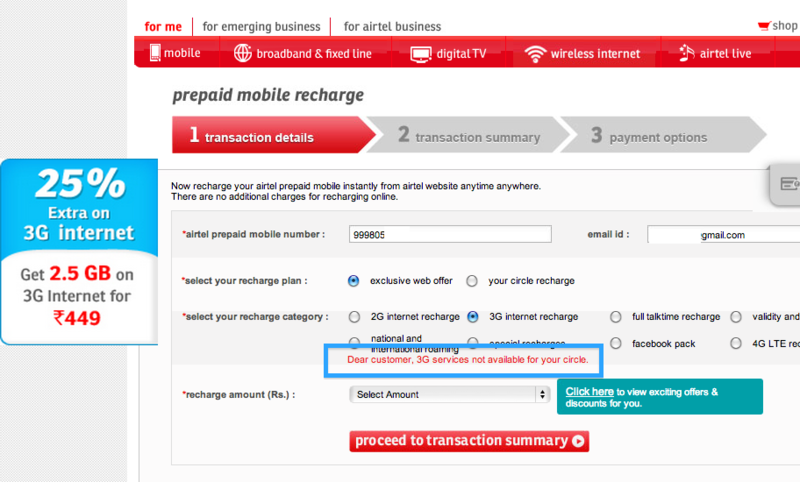 Now, being an Airtel user; I always faced this issue for 3G recharge and have suffered a lot. But the real nightmare is; Airtel is promoting their 3G services in Gujarat. Why? The reason is simple, their PPC team may not aware about this fact that they can not sell this service in Gujarat and other 6 circles. 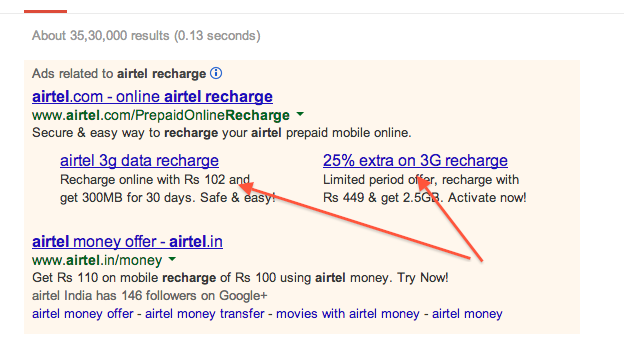 Go to Google and search with “Airtel recharge” keyword; you may see below ads in Google search result. The screen-shot is taken from my pc and my location is Ahmedabad (Gujarat). You will see the sitelink of airtel 3G promotional page and other promotional offer about 3G. Now, I visited Airtel recharge page from direct link of their recharge page and tried to get 3G data services for my Airtel number. Here is the screenshot that include error message displayed by airtel recharge page which clearly stat that the given facility is not available in your circle! As discussed earlier, the Airtel 3G service is not available in Gujarat and other 6 circles. If the marketing team knows this fact, they can save a lot of money by stop displaying these ads in Gujarat and other affected states. Google adwords provide best feature to limit your ads being displayed in particular region or states or city or locations. In this case, Airtel marketing team can exclude those locations where they are not offering 3G services. 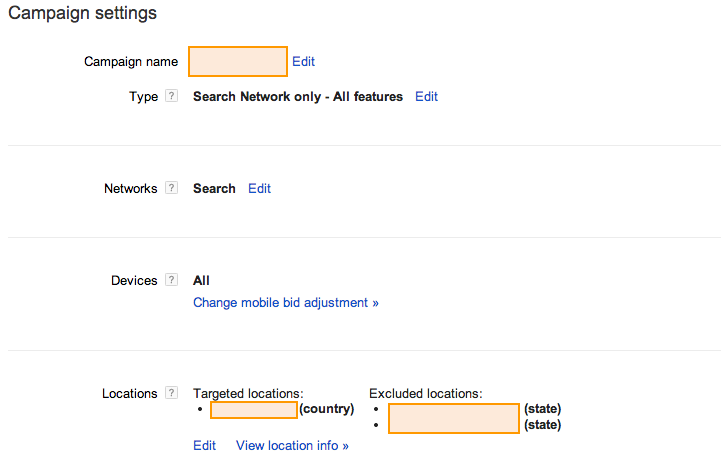 Once you do this setting, your campaign will only run on selected locations and will stop receiving non relevant clicks. Google adwords offers many features that can help you to target your campaign such a way that generate most relevant clicks. Your campaign will only perform better if you know how to use those feature effectively. It is very important for us to understand our product, their services, target audiences and accordingly set the campaign. It will give best result at least spending in Google Adwords. Perhaps their PPC managing agency missed the radius targeting option or bulk exclusion thing while setting up AdWords for Gujrat. They would surely figure this out in no time. But great that you discussed this in your blog which could be useful for beginners. I am sure, companies handing PPC for Airtel or such brands knows how to target Adwords campaign for region but i want to show how they are not liaising with their sales team to understand the market. I seen many brands wasting money like this and a small correction may result in better ROI. I seen your blog and it looks informative.. Good work Amit. Big Company just checking the static number from the export person. there is no analysis on investment on Online Ads and what returns from Online Ads. Yesterday My wife look ads on Facebook for Kitchen’s product and when she click on ads picture.Website was not working & It given error message ” Char is not allowed in URL”. non technical person don’t understand the error message they just close and website. it’s totally wast of money. A small audit of pages and campaign can really help such brands to save big on their online spending. Hope this article will help other online marketer to keep such points in mind while investing for their clients. It’s matter when we used paid campaign and and not make proper exercise. When we are targeting audience through online campaign, we really need to keep our eye on source and location of our traffic. That will help us to understand best converting audience and we can accordingly forecast on Google adwords campaign !